UFC's Inaugural event with ESPN is only a day away and the card is pretty stacked with Donald Cowboy Cerrone returning to 155 LBs to face a fresher opponent Alexander Hernandez along with a super fight between has some of the best matches Henry Cejudo and TJ Dillashaw at 125, the event definitely will be fun-filled but 125 LBs champ seems pretty carried away and is on a faceoff he was seen smashing a poor creature just to scare TJ off. We thought these celebrities would stop with animal brutality, but these things just keep crossing the limits. Recent UFC 143 Press Conference was the Dumbest of all. 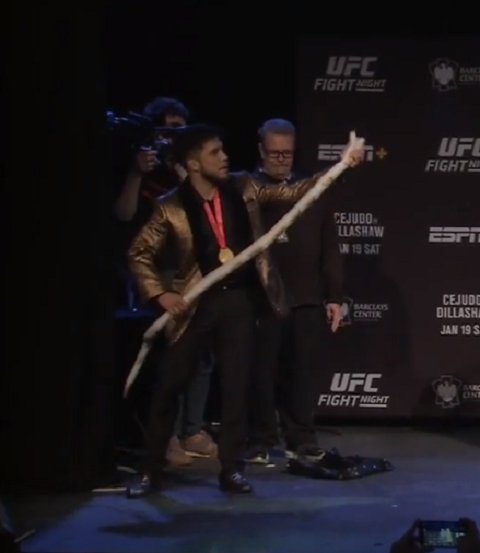 Cejudo at the faceoff brought in a snake, which, on the top looked like a rare snake and smashed it, then squeezed its head and threw it over to the media section in the front row of the conference hall. Who allows anyone to actively perform these things right in front of the world community? Who gave Henry Cejudo the right to harm a poor snake in the name of a fight promotion? We don't want to judge his conscience but Dana White was the man who handed Cejudo with a snake. T.J Dillashaw has many nicknames and one of it is Lieutenant Dan, and we all know who Gary Sinise is, hence he chose a poor reptile. According to State's Law on legless reptiles and "Dangerous Wild Animal Act"
"Under this section, no person shall possess a dangerous wild animal on or after January 1, 2014, unless he or she is authorized under an unexpired wildlife shelter/propagation permit or other exception. Dangerous wild animals include big cats, some smaller exotic cats, bears, elephants, hyenas, gray wolves, alligators, Snakes, crocodiles and nonhuman primates other than lemurs. Except as provided, no person shall acquire, buy, sell, trade, or transfer possession or ownership of a dangerous wild animal on or after the effective date of this section"
So, it's clear that the current 125 pounds champ might be in trouble for smashing a snake despite he bought it! What would Dana White say to the animal rights activist groups and what will Barclays Center, New York City's representative do if this issue gets the needed attention? Despite, the snake was claimed to be a fake by many media outlets, Cejudo's fear, and the snakes' reaction after the slam speaks about the reality of the situation. Animal Right activists are reportedly asking UFC for the footage. Despite, crushing the snake (literally), Henry Cejudo is not a popular fan's favorite at the UFC Fight Night 143 and is a heavy underdog to Killashaw, UFC fight night 143 show goes down, Saturday night at the Barclays center in Newyork.